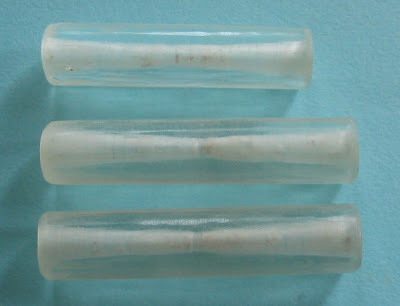 I purchased these 3 long cylindrical crystal beads from China. The seller had said Spring and Autumn period (771-476 BC) which makes them 2773 years old. From my experience Chinese sellers like to attribute anything crystal to either Spring and Autumn or Warring States Period and sometimes Liao Dynasty. I dont know the real reason for this penchant but my guess is that there must have been many excavations of crystal beads and artefacts from tombs of these periods. 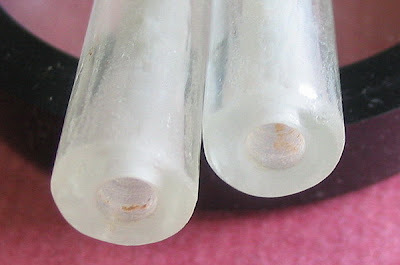 The beads measure from 3.5-4 cm, are drilled from both sides and drill marks are evident in the perforations. The shape is simple and elegant and the surface is quite pristine without much weathering except at the ends. There is something about ancient crystals which make me go gaga, although I am not really into new age beliefs, I guess they do have some kind of attractive energy. My knotting fervor has by no means abated and so I worked out this design of button and roll knots incorporating one of the long crystal bead in the centre flanked by smaller white ancient glass beads from Vietnam. 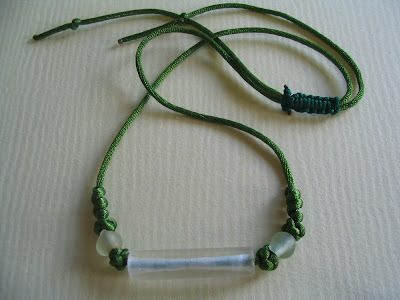 O well, genuine or not Spring & Autumn Necklace is a lovely name for my long crystal bead necklace. It feels very special and I shall have joy wearing it.